Signed and dated lower left: F X Fabre Flor./1795. After leaving Eton and Christ Church, Lord Holland travelled abroad on the Grand Tour settling in Florence for the winter of 1794-5. He returned to England early in 1796 bringing with him Sir Godfrey Webster's wife Elizabeth (Vassall) whom he married in 1797. Fabre's receipted account for six portraits of Lord Holland ('Ie portrait au pied de my Lord Holland, grandeur naturelle, quatre autres portraits, demi-figures ... un autre portrait …’) is dated Florence 17 April 1796 (British Museum Add. 52197, typed copy in NPG). In 1799 Holland sent two portraits to Dr William Langford, Lower Master at Eton, who chose 'the one that resembled his old pupil'; the other 'the sprightly man' was sent to the Provost's Lodge where it still hangs. Dr Langford seems to have ended his days in the Fleet Prison so it is conceivable that NPG 3660 was this version. Another version, signed and dated Florentia 1795, was at Sotheby's 21 June 1983 (14). One of Fabre's six portraits, a three-quarter-length standing with hand on chair in dark blue coat, white and red waistcoat, was in the Journal Room at Holland House (Pictures at Holland House, pp 27-8), with replicas at Eton and Bath (Mr M. Powys) and has been described as 'its precise, metallic assurance has an almost spivvish bravura amongst the grandiose atmospherics of Lawrence …' (D. Piper, 'Eton Leaving Portraits' in Burl Mag, June 1951, p 202). NPG 3660 shows Holland with a more thoughtful expression and wearing a ring - possibly a reference to his intentions towards Lady Webster. Thomas Pelham said 'the portrait for resemblance is everything his best friends could wish' (letter November 1796, cit. Ilchester, The Home of the Hollands, p 136n). 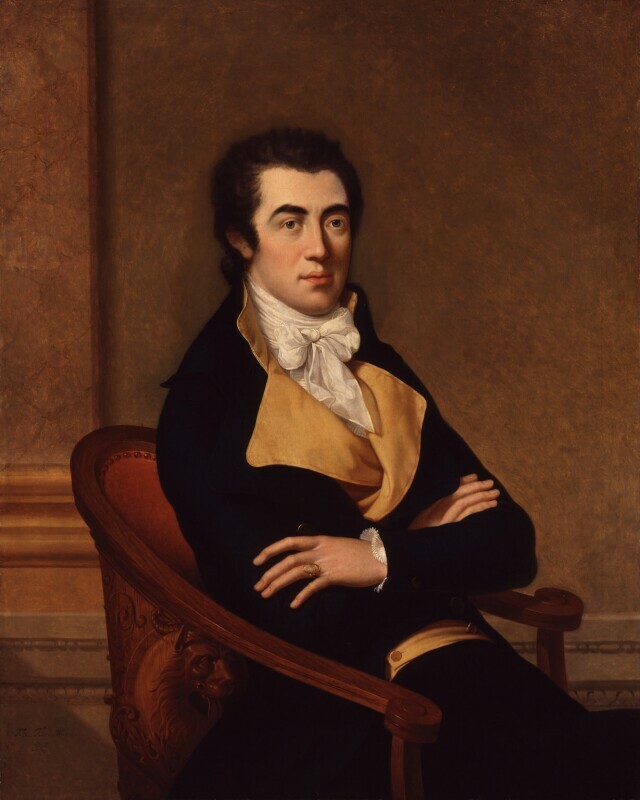 Half-length seated in a Directoire chair, arms folded, black hair and eyebrows, grey eyes, fresh youthful complexion; dark blue coat, yellow waistcoat with broad lapels, white tie and shirt with frilled cuffs, cameo ring on third finger of left hand; plain architectural background. Lord Holland and by descent from his daughter (and sole heir) Mary Elizabeth who married Lord Lilford in 1830; Sotheby's (Lilford sale) 18 May 1949 (99) bought Leggatt for the NPG.